The main (only?) downside to shopping at Zara is that items can often go everywhere, meaning that you quickly become tired of those pieces that you see every time you leave the house. There are, however, many stealthy buys from Zara that look on trend, but you'll still love them for several seasons, as they aren't as instantly identifiable. Our editors believe that the trick to not buying the same pieces as everyone else from Zara is to avoid the bold statement pieces you'll find in the windows or placed at the front of the store. Instead opt for the more minimal, seasonless pieces, such as satin sliders, expensive-looking handbags or white shirts with interesting silhouettes. As ever, we've done the trawling for you, and we found 16 of the best pieces that you might overlook in your usual Zara shop. Scroll through the gallery below to see 16 of the smartest buys from Zara that everyone won't have… yet. 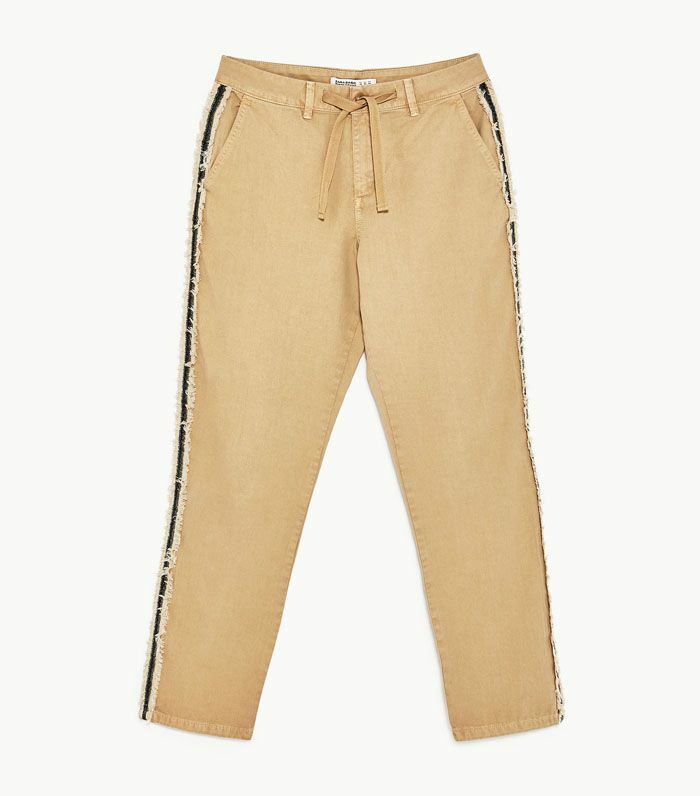 Chinos have overtaken skinny jeans this year, and we love these classic khakis with a frayed stripe down the trouser leg. These elegant slingbacks are a classic purchase that you'll love for years. These oversize hoop earrings look far more expensive than £13. These cropped white jeans will be a summer staple. The pearl buttons update this classic blazer. The key to finding expensive-looking handbags at Zara is to opt for the minimal styles. These satin bow slides would look seriously cool with a pair of wide-leg culottes. The tie detailing adds a little extra something to this plain white T-shirt. The open back elevates this everyday basic. This floral scarf looks amazing in the city looped around your neck and worn on holiday around your basket bag or beach plait. The waistband makes the sleeveless shirt particularly flattering. Pair this khaki belted skirt with satin sliders and a white simple shirt or T-shirt. If you're into the cropped jeans trend, we love the fit of these denim culottes. The basket bag trend shows no sign of slowing down, and you don't need a beach holiday to wear this circular bag with a long strap. No one will be able to tell these cat-eye sunglasses are from Zara. If you work in a casual office, this knotted dress will be a hero item this summer. For more shopping tips, see the Zara section editors are trying to keep a secret.